The body of a kayaker who went missing on Georgian Bay Friday afternoon has been found. The OPP received a report of a kayak that had overturned off Midland Bay Woods in Tay Township on Friday afternoon around 1:15 p.m.
A rescue helicopter from the Joint Rescue Coordination Centre in Trenton and an OPP helicopter were used in the search. 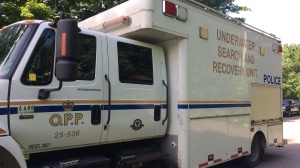 The OPP Underwater Search and Recovery Team was also called to assist. Family members tell CTV News the victim is 61-year-old Debby Chambers of Port McNicoll. She's a mother of two sons, both of whom are getting married later this year. It's believed Chambers went out on the water in her kayak to catch up with her dog. The kayak overturned and Chambers fell into the water. The OPP say she was not wearing a life-jacket. The OPP's underwater search and recovery unit found the woman's body around 7:45 p.m., about 300 to 400 feet from land. Chambers' body has been sent to the coroner's office to determine exact cause of death.